Introduction: Let's look at the relationship between a triangle and its medians. Let's find some relationship between the two triangles. 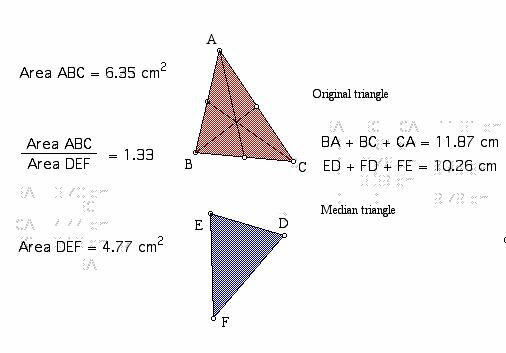 First, let's compare the areas of the two triangles. Their areas and perimeters are not equal. The ratio of the areas is the same but the ratio of the perimeters is different. Although we change the lengths of the orginal triangle, there is no change in the ratio between the two triangles. If you want to check these facts, click here. The two triangles are neither congruent nor similar. 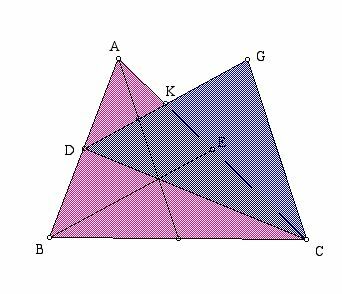 and ( the area of the triangle CDK ) = 1 / 2 * ( the area of the triangle CDG ). 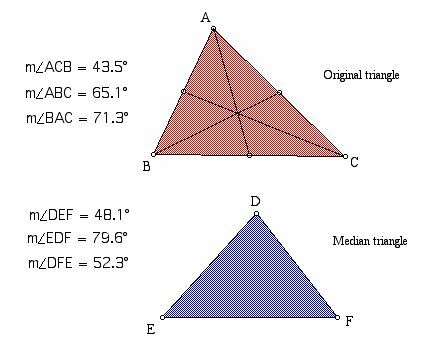 We can conclude that (the area of the triangle ABC) / ( the area of the triangle CCG) = 1.33.